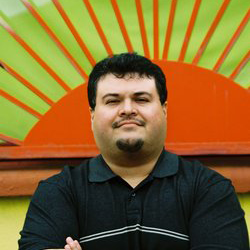 The Rio Grande City Public Library is proud to announce that on Monday June 28, 2010 at 6pm we will have the pleasure of having Xavier Garza a prolific writer, artist and storyteller introduce his new children's book. Kid Cyclone Fights the Devil and Other Stories is a sequel of to his earlier Creepy Creatures and other Cucuys. Garza will be doing a reading / book signing at the library. Xavier is originally from Rio Grande City he is the son Margarito(t) and Amalia R. Garza. He is a graduate of Rio Grande City High School. Xavier received his BFA at UT Edinburg in 1994, and his Masters in Art History at UTSA in 2007. He is the author/illustrator of six books, Creepy Creatures and other Cucuys (Arte Publico Press), Lucha Libre: The Man in the Silver Mask (Cinco Puntos), Juan and the Chupacabras (Arte Publico Press), Charro Claus and the Tejas Kid (Cinco Puntos) and Zulema and the Witch Owl (Arte Publico Press), and Kid Cyclone fights the Devil (Arte Publico Press). His seventh book, A Lucha Libre Novela is slated for release in 2011. Xavier has made San Antonio his home since August of 2000.